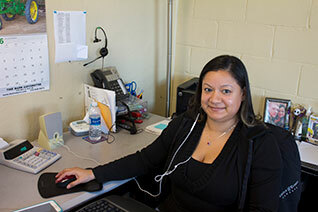 As office administrator, Karina coordinates and supervises business-office functions. Her responsibilities include tracking accounts payable and receivable, updating licensing and certifications, insuring compliance with DOT regulations, and organizing insurance documentation. She manages our communication, office equipment, and software accounts. Karina assists team members in incorporating technical tools and office supplies that make our operations efficient and up-to-date. Karina provides administrative support by gathering information from prospective clients, fielding requests from existing customers, and circulating the information to the appropriate team member. She participates in tracking labor and materials cost, preparing and distributing project reports, and in managing our inventory, customer, vendor, and other data bases. In a human resources capacity, Karina assists in our participation in workman’s compensation and health insurance programs; She provides support for new hires in their job application process, in navigating their period of onboarding, and throughout their employment. She manages our company calendars. Every day Karina is involved with every department and is accessible to every employee. Fully bi-lingual, she keeps the avenues of communication open- companywide.